On one of my last days in Paris, I stumbled across what I’d been looking for for some time: pamphlets by a French independent publisher. 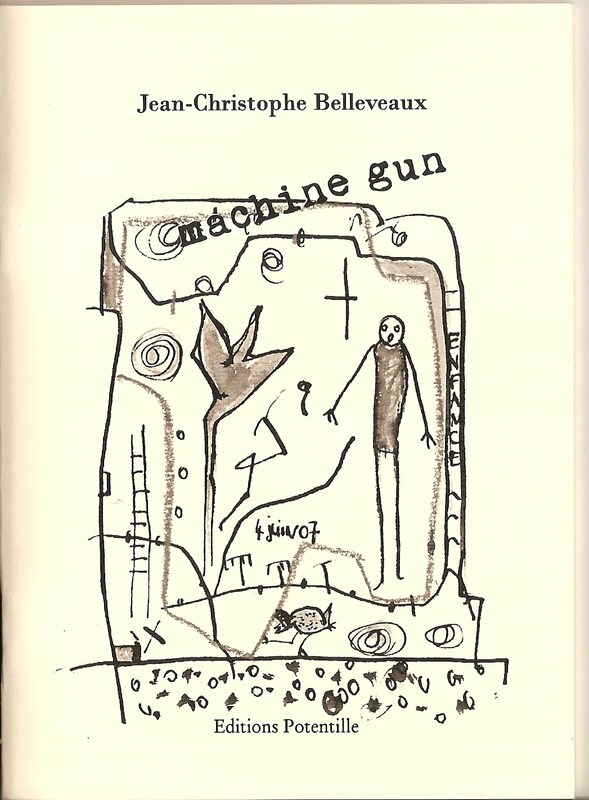 Jean-Christophe Belleveaux’s machine gun stood out from the other pamphlets on sale with its lack of sentimentality and the terseness of his language. Editions Potentille, the publisher of these 13×18 chapbooks, was created in 2007 by Belleveaux’s wife, Anne. Refreshingly, this independent publisher escapes the monopoly of Paris by being both funded and located in Boulogne-Sur-Mer, in the North of France. The pamphlet can be read as a collection of twenty poems or as an extended monologue. There are no titles, capital letters and practically no punctuation to fragment the whole. Yet, the short selections on each page suggest that this dual method of reading is intentional and indeed, most poems stand alone well. It is best, however, to read Belleveaux’s pamphlet in one sitting in order to fully get the effect of these otherwise fugitive pieces. He writes that these burned words speak of his sadness but not of his anger. Belleveaux mixes image difficult to decipher alongside straightforward narratives. These impressionistically build the complex portrait of a man of words struggling to control them. The end comes swiftly and devastatingly with ‘la page est un nid dévasté’ (the page is a ransacked nest). Overall, this is a moving collection that employs such tired subjects as war and writing-about-writing in a way that feels fresh. While the personal details can at times be at risk of shutting out the reader, Belleveaux is always careful to throw out a helpful hook. This is an inward-facing pamphlet, but the self-deprecation and wit are generous indeed.